From sultry Bangalore, we escaped to chill out at Kodaikanal. The name Kodaikanal means the "gift of the forest”. 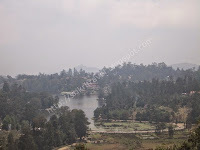 Kodaikanal is also known as Kodai in short. It is also called as Princess of the Hills. We hired a tourist vehicle for a day to have a glimpse of the hill. Our day started in the chill and Misty weather (hmmm…. :)) to Kurinji Andavar temple. Kurinji Andavar Temple: It is about 4 km from the city. The main deity is Lord Muruga and other deities like Lord Ganesha, Lord Vishnu, Lord Hanuman and Navagraha are present here. Kurinji is the flower that blooms once in 12 years. 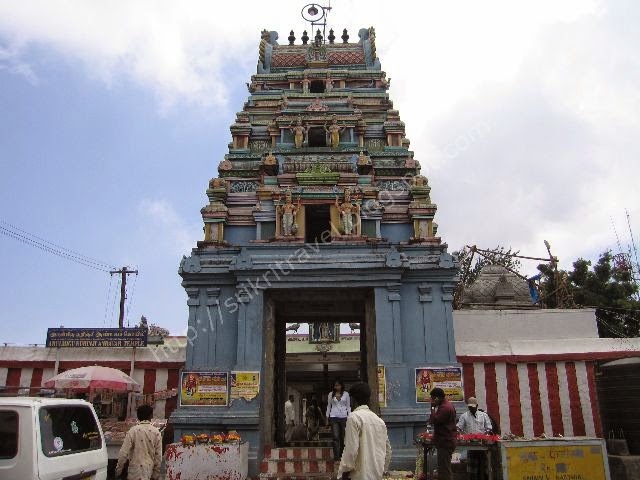 Here Lord Muruga is known as Kuringi Andavar which means God of Hills. From here one can have a panoramic view of Palani hills and Vaigai dam. Since it was misty, we were unable to view :( . Chettiar Park: Chettiar Park is on the way to Kurinji Andavar Temple. This park is calm and beautiful. The park was planted with flowers for the flower show. 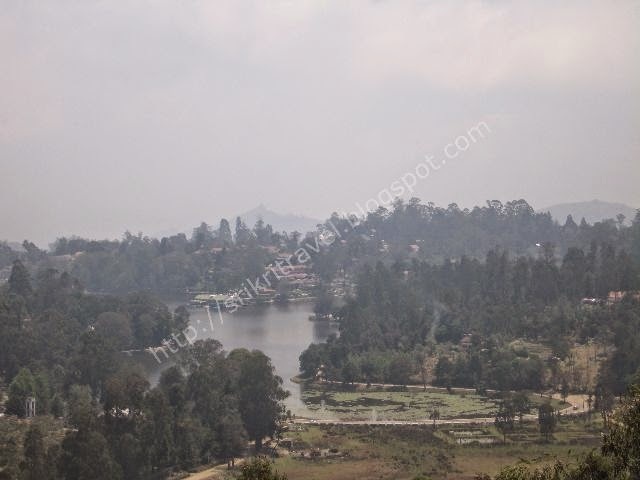 Upper Lake View: It is the view point from Kodaikanal Lake resembles the shape of India map. Some feel it resembles the star shape. 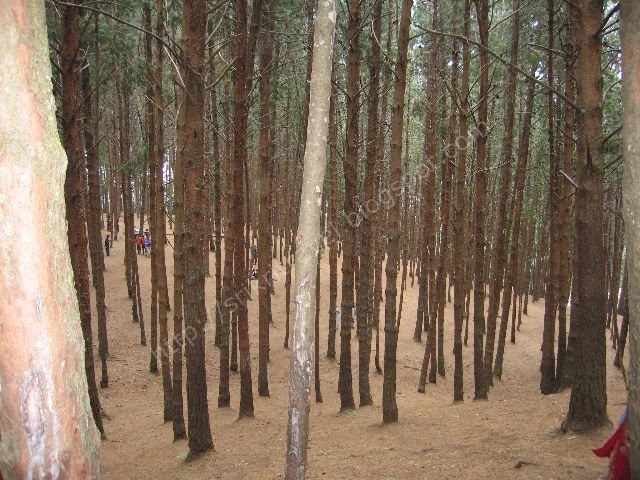 Pine Tree Forest: As the name suggests, it is place full of Pine trees. One can see the pipe cones lying here and there. 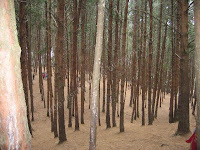 We walked down the very tall Pine trees and took few snaps. Moier Point: Moier, British national who is the 1st person to visit Kodai and planned the hill station. Hence memorial pillar is erected in his name. Vaigai Dam View: This view is nearer to Moier’s Point. We were not able to see the view as it was fully covered by mist. Silent Valley View: In Silent Valley view one can see the scenic beauty of the Hills. The valleys are very steep and slippery. It is said that few people have accidentally fallen from this valley. To prevent this iron grills have been put in many places. Guna Cave: A cave that became popular after the Tamil film Guna was shot. Even this place is very steep and very risky. Entrance fees for Silent Valley view and Guna Cave are Rs.2/- per person. Few years back this cave was open to public for viewing. Nowadays the entrance into the cave is blocked by grill. We saw some people defied this and jumped out of the grill and trying to get into entrance of the cave.